Today is Céline Sunday. That twice-yearly moment when Phoebe Philo offers up her clothing and accessory propositions for the season ahead. 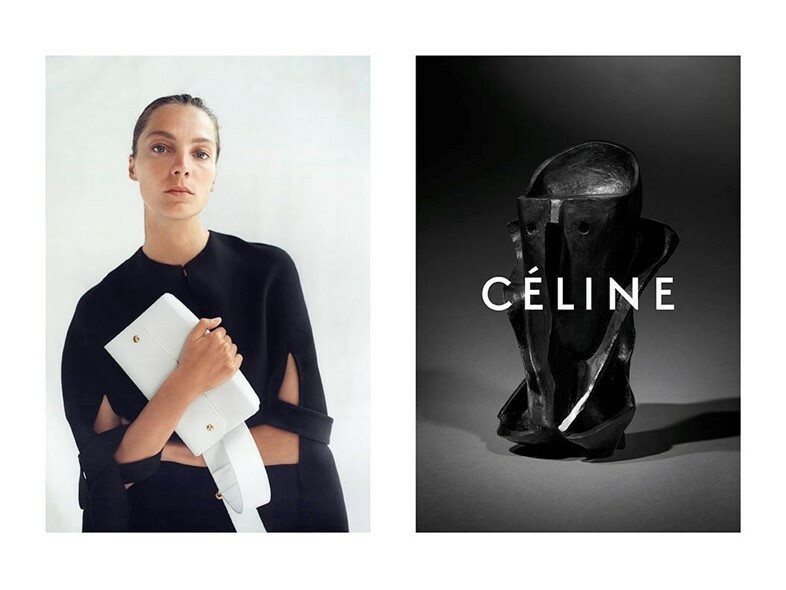 The brilliance of Phoebe's work for Céline is that it can be also used to inspire solutions for modern living. Keywords include: confident; strong; proud; straightforward; powerful; discrete; comfort. Apply these to everything. For example: Is that body language confident? Is that a straightforward email reply or is it going to cause the recipient confusion? Is one going to feel comfortable in that outfit? It was the American architect Ludwig Mies van der Rohe who first coined the phrase "less is more". 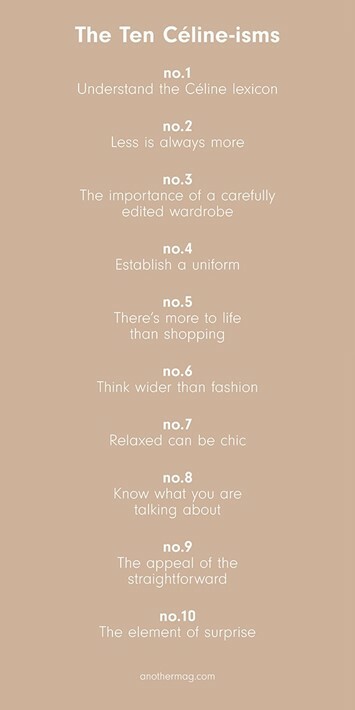 It’s an overused phrase these days but in the Céline world, it’s key. Less is more can be applied to everything, from dress to social media. The Céline woman promotes natural beauty. Who needs a big bag when a small clutch will suffice? If you're getting a manicure, choose one of your "house colours" (see Céline-ism no. 4) – fawn, navy and khaki are very Céline. Never show too much flesh. "I find glamour and sexuality awkward," Philo told Tim Blanks after today's show. A bare shoulder or arm should always be balanced by a covered-up bottom-half. The Céline wardrobe is never bursting with lots of garments, only ever worn a handful of times. It is rigorously edited. The Céline woman is experienced in what works and what doesn’t. She isn’t interested in frivolity. “What I love is this idea of a wardrobe,” Philo told Susannah Frankel for The Independent in 2011. “… I do think that the world doesn’t need many more frivolous bits and bobs that end up left in cupboards or landfills.” That rigorous method of editing can then be applied to the contents of one’s handbag/suitcase/desk/desk drawer etc. Have twice yearly clear-outs and be super strict. All the best creative minds have a uniform, from Karl Lagerfeld’s white shirts to chef Fergus Henderson’s blue painter's jacket. Philo’s uniform consists of Adidas Stan Smith’s (also Nike Air Max); cashmere sweaters; wide trousers; quality white T-shirts; a worn-in leather jacket; gold earrings and rings. It saves you time – packing for a holiday or dressing for an event. If one has a uniform, one has less sartorial decisions to make. Decide on your "house colour palette" (three is usually easiest). Buy lots of the same; always the best quality one can afford. In today's show, models wore a new season Céline all-white trainer. Wearing trainers with a beautiful dress is very Céline. Go occasionally and shop alone. Keep focused. Question everything. Do I really need it? Will it last a long time? These questions can be applied to everything – not just clothes and accessories. New items can be brilliant and can add fresh dimension to one’s wardrobe but choose carefully. 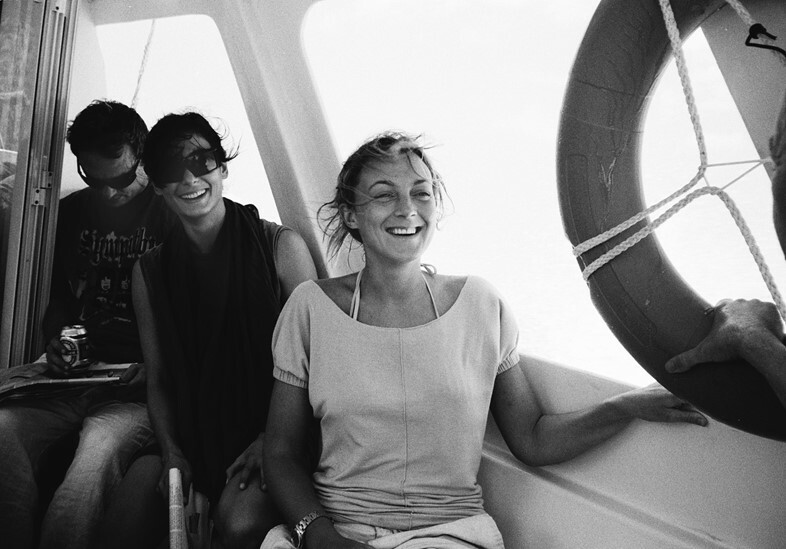 “Probably no one defines the modern sense of comfort with more authority than Phoebe Philo of Céline” – Cathy Horyn wrote for T Magazine in 2014. Comfort is always key. Why wear big heels that you know are going to cause pain later in the evening? This goes in hand in hand with Céline-ism no. 6. Feeding one’s mind means you are enjoyable company, someone who can offer cultured and inspiring conversation. Learning is fun. Always strive for the best. Create the best work you can. Research everything – from the best white T-shirts, to the best hamburger. When Philo featured in the Financial Times’ prestigious Lunch with the FT column in 2010, she chose to dine at St. John, Fergus Henderson’s restaurant in Clerkenwell, London. “It’s very to-the-point,” she said, “I’m not very interested in decoration." Question every accessory – the Céline way would be to never have more than one. A coat worn across the shoulders is a strong styling statement and can be a perfect accessory with a small clutch. Despite a defined formula, the Céline woman is dynamic and exciting. The unexpected every now and again is great. “A bucket of KFC” would be Philo’s death row meal, she told Penny Martin in The Gentlewoman's inaugural issue. She loves hip hop. Today, her collection included pom poms, padded duvet coats and delicate animal prints (otters, foxes and deer)! And each girl promoted an individual style of make-up: a few with barely there make-up, others with striking eyeshadow or bright red lips. Throw in a few surprises now and again, keep people on their toes.